CODAC aims to provide the highest quality of services to help our members meet their goals and objectives. We would like to have your feedback on what you like about your interactions with CODAC staff and how we can improve the services we provide. Here are some ways you can let us know your concerns or problems. Talk openly with your Case Manager. Complete the Member Satisfaction Survey and other surveys distributed during the year. You don't have to give your name. Surveys help us learn more about your experience with the services we are offering and how you are improving. All answers are confidential. Click here to take the online Member Satisfaction Survey. Give us feedback by filling out a Member Comment Card in the lobby or online. Click here to fill out the online version of our member comment card. Attempt to resolve the problem directly with that person. 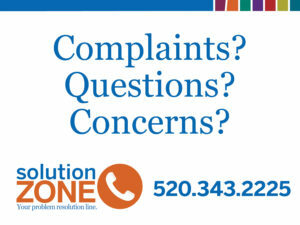 Call the Solution Zone, CODAC's Internal Member Services phone line at (520) 343-2225.When you call the Solution Zone, you will talk over the phone with a member of our Quality Management team who will work quickly to help you get the answers you want or need. The Solution Zone is safe, confidential and helpful. Ask someone at the CODAC front desk for a Problem Resolution Form. You can ask anyone that you feel comfortable with to help you fill out this form. For concerns about fraud and abuse, send a confidential fax to CODAC's Corporate Compliance Officer at (520) 202-1845.
Review the Grievance and Appeal process posted in all CODAC lobbies. You may also contact Cenpatico at (866) 495-6738.